Hungarian Gas Storage Ltd. (MFGT) sells part of its remaining capacities as auctions starting from the storage year of 2014-2015. The number of auctions has been massively increasing in recent years. 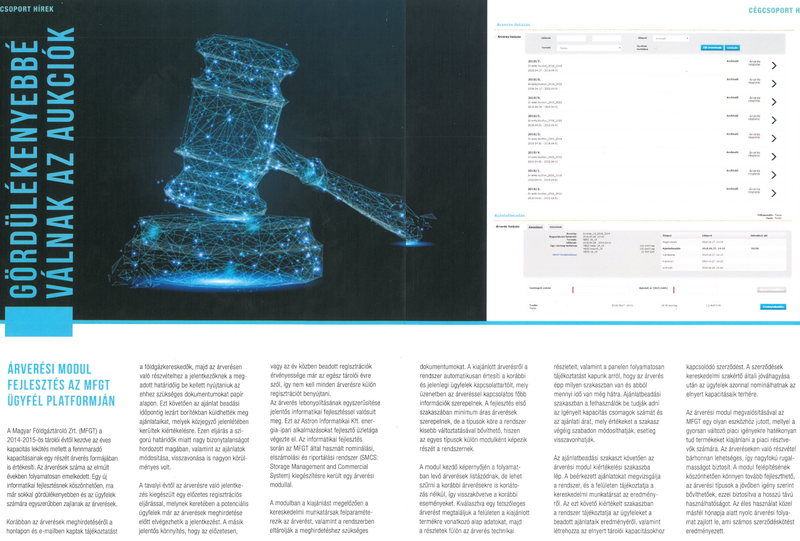 Thanks to a new IT development the auction process has become more streamlined and easier for customers. The simplification of the auction was realized by a significant IT development that was completed by the Energy Applications Business Unit of Astron Informatics Ltd. In the course of IT development, the Storage Management and Commercial System (SMCS) used by MFGT has been exended with an auction module. “Thanks to the structure of the auction module, it is easy to upgrade, and the auction types can be expanded in the future, so we have created a long-term tool for MFGT that can effectively offer products to the rapidly changing market needs.” said Zoltán Jacsó, director of the Engergy Applications Business Unit of Astron Informatics Kft. The technical details of the development have been published in the MVM Innovator magazine. The full article is available in Hungarian and can be downloaded here.